5 LEADER/OPINIONS* ‘Till the cows come home; The Olympic legacy will be the intangibles: Sir Robin Wales; No allowance for windfalls anymore:Christine Field; Starting the clock: when is an application properly made? : Simon Ricketts; When impact may not mean a collision: Andrew Rogers. 9 LETTER from Sir Terry Farrell: Gateway plan not ‘London-centric’. 11 LONDON FIRST Judith Salomon; The Mayor’s housing strategy; Crossrail – the time is now; London Planning Awards add new category for 2007. 14 BRIEFING* DCLG borough performance tables; !PILLO! There is a duty to consult – but how to go about it? 18 BOOKS 1 Riëtte Oosthuizen of Knight Frank reviews Neighbourhood Renewal and Housing Markets ed by Harris Beider. 19 EFFECTS-BASED vs ACTIVITY-BASED PLANNING* Zoë Cooper of the EA explains the New Zealand system. 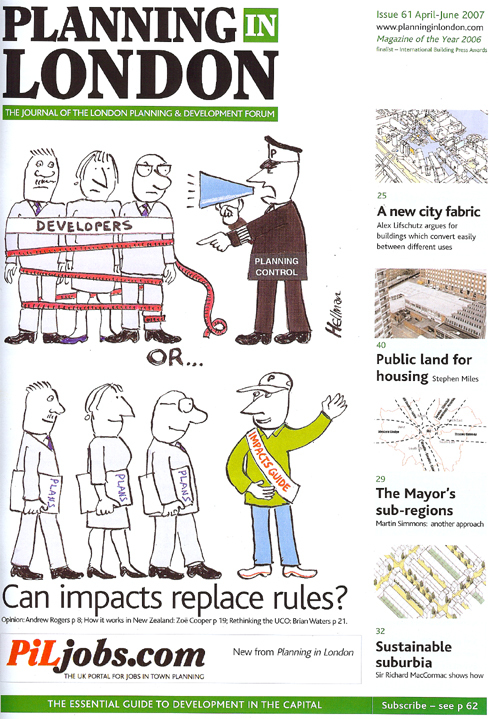 21 LIBERATING CONTROL OF THE USE OF LAND AND BUILDINGS* Brian Waters (your editor) says its time to rethink the UCO. 29 THE MAYOR’S SUB-REGIONS – FIT FOR WHAT PURPOSE? Martin Simmons puts forward a different approach. 32 SUSTAINABLE SUBURBIA* Sir Richard MacCormac shows how. 37 LONDON’S UNTAPPED POTENTIAL FOR HOUSING ‘Windfall’ and small sites have much to contribute says Will Teasdale of Llewelyn Davies Yeang. RPS’ Stephen Miles on the conclusions of his report for the TCPA. 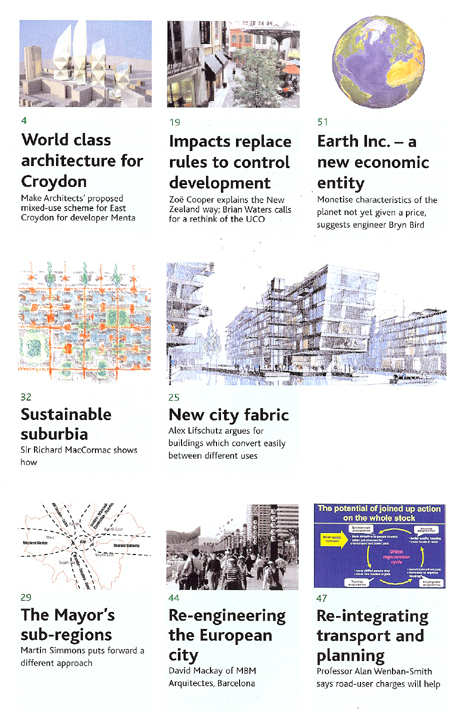 43 BOOKS 2 Graham Loveland reviews Harley Sherlock’s An Architect in Islington. 44 RE-ENGINEERING THE EUROPEAN CITY David Mackay of MBM Arquitectes, Barcelona. 47 RE-INTEGRATING PLANNING AND TRANSPORT Professor Alan Wenban-Smith says road-user charges will help. 51 EARTH INC. – A NEW ECONOMIC ENTITY Monetise characteristics of the planet not yet given a price, suggests engineer Bryn Bird. 53 PLANNING AGAINST GROWTH Reform needs to be on the supply-side, says Dr Oliver Hartwich. 55 COUNCILLORS IN PLANNING A hot topic, explains Arup’s Jillian Hastings. 57 WHERE HAVE ALL THE PLANNERS GONE? A new report by Tim Edmundson and Elizabeth Rawson.